Preston the Puggle » Blog Archive » Preston on TV!! Awhile back, Mommy and Daddy were contacted by the production company about putting Preston on Animal Planet’s special called “Dogs vs. Cats“. They were thrilled that Preston could show the world how funny and smart he was on TV! After months of anticipation, the show finally aired on Saturday. It was a very entertaining show and brought good laughs to Mommy and Daddy. In the show, dogs and cats go head-to-head in seven competitions: companionship, athleticism, cuteness, history, cleanliness, intelligence and cost. Preston represented the dogs in both companionship and intelligence competitions. Here are some behind-the-scence photos during the filming of the intelligence competition. After a week-long road trip, Preston arrived at his new home in Houston the night before “Dogs vs. Cats” aired. Mommy and Daddy brought a TV with them in the car and scheduled the cable installation on Saturday afternoon in time to catch the 7pm show. There were only a dogbed and a TV in the empty living room but tons of fun and laughter from watching the whole family on TV! Hope many of you got to watch the show. If you missed it this weekend, a re-run is scheduled on August 7th (sat) 3pm ET/PT. For those of you who don’t have access to Animal Planet, here is a brief summary. In the Companionship competition, Preston was asked to choose between Mommy and 30 pounds of Bacon. Later in the show, Preston faced a tough opponent in the intelligence category. He was going against Vegas show cats! Mommy and Daddy were impressed by what those professional show cats could do but they had confidence in Preston. Congrats! Preston won it for the dogs in the intelligence category! Mommy and Daddy were so proud! 12 Responses to Preston on TV!! Oh my Preston!!!! We loved the show! You and your Mommy and Daddy were great! 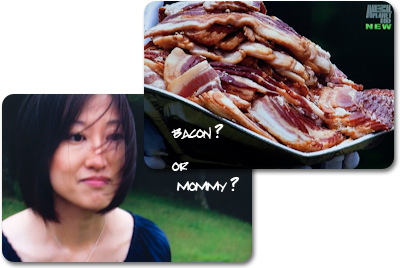 Both my Mama and Daddy laughed hard and loud at the Bacon scene. We didn’t blame you one bit…I’m sure your Mommy didn’t either! You definitely won the most important competition! You were pawsome in the intelligence! Great Job! We welcome you to TEXAS! We especially loved the picture of the empty room with just the TV for the most important show! We cannot wait to meet you and hope to see you on TV again soon! My parents were astounded by how smart you are, Preston!!! And we all totally cheered when you won in the intelligence. we knew you would make the doggies proud preston! Hi! I just wanted to say how proud I am of Preston for showing off his smarts on animal planet! I am the proud mommy of a tri colored puggle named Delilah who delights me everyday with how funny and smart she is! Puggles are truly one of a kind! Oh Preston, you made us so proud!!! Mommy was laughing and shrieking with excitement for you and your pawrents! The whole family got to make the show!! We watched it again last night with Daddy and he couldn’t believe you know 70 stuffies by name!! He was impressed! Welcome to your new home by the way! I think you are going to settle in nicely there! Stay Cool! Congratulation Preston, you are so so so so smart!!!! Hopefully Animal planet will post this show on their website, I MUST NOT miss this show~~~ love you so so much Preston! We are so sorry we missed the show! You are one smart doggie, Preston! We would have gone for the bacon too! OH HOW EXCITING!!!! Happy Dance! Can’t wait to see it! Oh Preston, you make all us Puggles look real smart! Congrats! 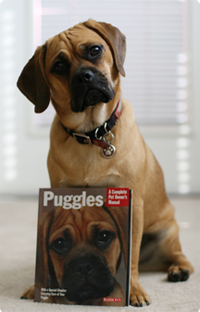 Oh to think we can say we knew you when you were just the model for the first puggle book and you will be a big movie star. He has done print, blog, tv, so next is the big screen! So proud of you Preston!!!!! Preston! You did great! We were so excited to see you on TV. We made sure we where home in time to watch and we recorded it! Chloe was so excited to see you on TV she jump on the table and tried to get into the tv, it was hysterical! You looked so handsome and did a great job! Puggle Preston what a Great dog. You won it for us doggies everywhere. WooHoo! Yes human Granny said I would go for the bacon too and leave her sad. BOL! You are the most famous Puggle I know except for me! Snicker! Snicker! Oh my God, Preston – that is the coolest, coolest thing!!! I wish we had Animal Planet and could have watched it too…that sounds like the most awesome show!